The following story was shared on facebook. It is a tremendous read. I have copied it here in part because I was unable to link solely to the article on facebook, but please click on the link to the author's page and give props to both Luke and Jeff Kirby. “The Book Of Luke…” He has always accommodated the numerous requests from TV and print reporters to speak to him, and patiently complied with the frequent invitations from an adoring public for a picture or an autograph or a handshake. He is an extraordinarily gifted athlete and student, which is why he is in the National Honor Society and will play basketball next year for Coach K at Duke. It is also why he has been named to every all-star team across this land and is, as was announced Wednesday night, Ohio’s Mr. Basketball for the second year in a row. 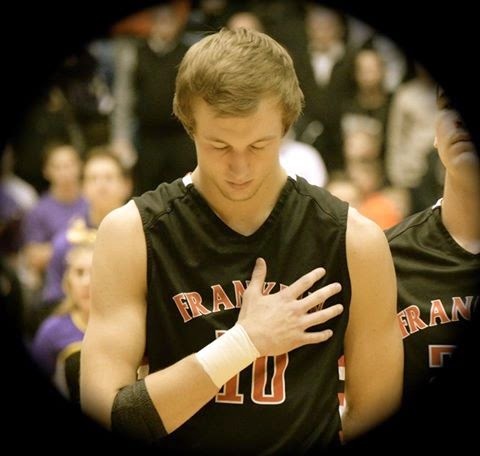 But let me tell you what Luke Kennard, the Franklin H.S. two-sport all-star athlete, appreciates the most, whether it’s in sports or in life. It may not be what you are thinking. It’s not the adulation and the attention that can feed his ego (since that’s the American way, right?). No, what he enjoys the most – thrives on, actually -- is the warmth that comes from being part of something bigger than himself. It’s so much easier to pat someone on the back when their own hand isn’t in the way. When he passed LeBron James on Ohio’s all-time scoring list a month or so ago, Luke was asked to draw comparisons between him and the NBA legend. But Luke preferred instead to talk about the energy the Wildcats felt from the Franklin community, and how blessed he felt just to be part of it. When he was named a McDonald’s All-American, putting him in exclusive company with only 23 other high school basketball players in the nation, he was asked to speculate on where such an honor put him in relation to all the others. But all Luke preferred instead to talk about was the love and support the team could feel from their fellow classmates, and how blessed he felt just to be among them. Then last Saturday afternoon, when the ‘Cats narrowly missed going to the state tournament with a crushing one-point loss in overtime (oh, that still hurts), Luke was asked to talk about his career and his achievements and all that he has meant to Franklin. But Luke preferred instead to talk about his teammates and the love he will always have for them. Luke is smart and well-versed on a number of subjects. But he loves talking about his teammates way more than he likes talking about himself. He also thanks his coaches, head coach Brian Bales (a Division II state coach of the year), and his assistants, Brent Rambo and Josh Taylor. He especially thanks his parents, Mark and Jennifer, his sister Lauren, his girlfriend Anna Castro, and all of his extended family. He feels blessed to have all of them in his life. He loves being part of a family. AMID THE RELATIVE CALM during the playing of the national anthem, Luke has always put his right hand over his heart, bowed his head and shut his eyes. Because I’ve known all season I would be writing this story (but never told Luke about it), I’ve captured this moment about 10 times, hoping to get a good one. I’m no photographer, but I love this image. I love it that Luke does not worship at the feet of his own success. I love it that he leads by example, not by command. I agree with him that although faith presents a thousand scientific, moral and theological questions, there is comfort in the belief that we are part of something much bigger than ourselves. Luke and his family renew that faith each Sunday at Horizon Pointe Church in Springboro. With his head bowed and eyes closed, there is no request for Franklin to win the game, because God doesn’t care who wins ball games. Likewise, there is no request for personal gain, because personal character is far more important than individual success. It says: Thanks for the world around me, and the people in my life. Thanks for giving me certain athletic gifts, and the dedication to refine them to the best of my ability. Thanks for giving me this opportunity. Now, I will repay the gift by performing in a way that benefits others, not just me. So basic, and yet still so powerful. When Luke was named Mr. Basketball the other night, it created another moment when all of Wildcat Nation came alive to publicly offer another standing ovation, and express appreciation. “Thank you, Luke. We’ve been blessed with all you’ve done,” the sentiment goes. But Luke would offer a quick response. "Once A Wildcat, Always A Wildcat"
"The Heart of the Panthers"